Im Februar 2015 war es wieder so weit: IPCC-freundliche Kreise ließen per Zeitungsartikel mitteilen, dass die Sonne nichts mit dem Klimawandel zu tun habe. Da sei man sich jetzt ganz sicher. Diese unsinnige Diskussion müsse endlich ein Ende nehmen. Sämtliche Publikationen die einen solaren Klimaeinfluss fanden müssen wohl von der fossilen Brennstoffindustrie bezahlt worden sein und wären damit unbrauchbar. […] Despite all the attention to who funds him, it is important to note that much of the controversy here is about Soon’s actual scientific views. While Soon has challenged the conclusions of other climate and environmental researchers on subjects ranging from the vulnerability of polar bears to the planet’s climate history, one of his principal arguments has long been that variations in the behavior of the sun, rather than human caused greenhouse gas emissions, are the central factor driving climate change. This “it’s the sun” claim is an extremely popular argument with climate change doubters — according to the website Skeptical Science, it is the second most popular anti-global warming argument of them all, second only to “climate’s changed before.” So is there any truth to it? After all, regardless of who supports his research, if Soon is actually right on the substance then we may be getting all worked up about global warming for nothing. Eine tolle falsche Fährte: Die Sonne erreichte in der zweiten Hälfte des 20. Jahrhunderts eine der stärksten Aktivitäten der letzten 10.000 Jahre, und die Argumentation konzentriert sich auf die letzten 30 Jahren, von denen 17 gar keine Erwärmung zeigen. 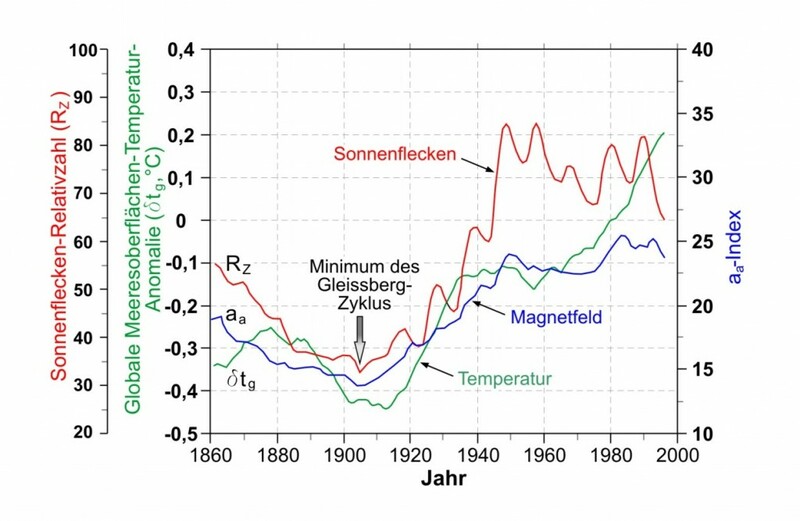 Zudem geht es wohl gar nicht um die „Total Solar Irradiance“ (TSI), sondern vielmehr um mit der Sonnenaktivität gekoppelte Magnetfelder, die ihre stärkste Phase 1980-2000 erreichten (Abbildung 1). Abbildung 1: Entwicklung der Sonnenaktivität während der letzten 150 Jahre am Beispiel der Sonnenflecken und des Sonnenmagnetfeldes (nach Mufti & Shah 2011). […] It isn’t only the IPCC that concludes this. “No satellite measurements have indicated that solar output and variability have contributed in a significant way to the increase in global mean temperature in the past 50 years,” concluded a recent workshop report from the National Academy of Sciences. The report noted that while the 11-year sunspot cycle can lead to changes in total solar irradiance of as much as .1 percent, that only translates into a “few hundredths of a degree centigrade” temperature response on the Earth. “Clearly the sun matters and if it varied a lot then there would be consequences, but it doesn’t,” explains Kevin Trenberth, a prominent climate researcher who is also at the National Center for Atmospheric Research. 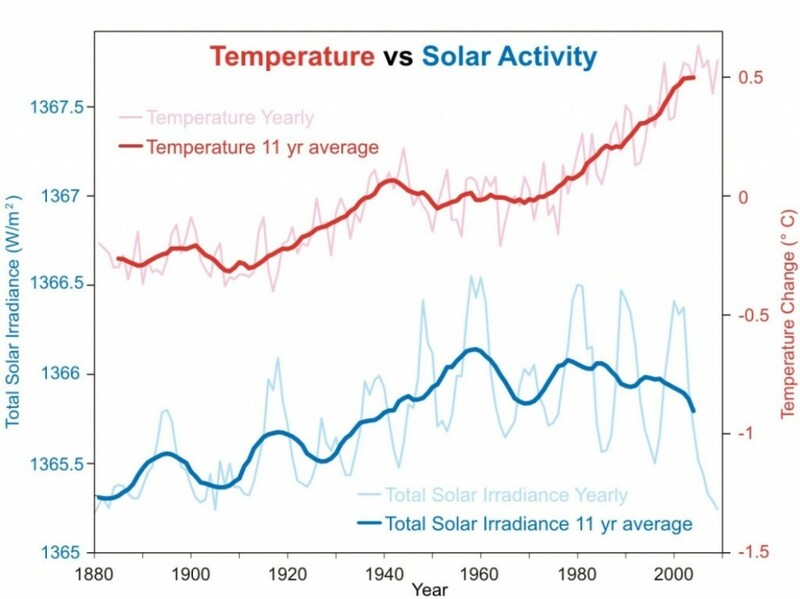 “The variations are only order 0.1%.” Of particular significance is the fact that solar irradiance has not shown an increasing trend over the past several decades, while global temperatures clearly have. Ein wirklich unsinniges Argument. Hier wird vergessen, dass es Jahrzehnte dauern kann, bis sich das träge Klimasystem an eine höhere Sonnenaktivität anpassen kann. Analog Kochherd: Eine konstant hohe Flamme schafft es ja auch, einen Topf Wasser stetig zu erwärmen, bis die jeweilige Gleichgewichtstemperatur erreicht ist. So in sum: It’s not that the sun can’t influence climate. It can, and it does. And climate scientists have accordingly been studying the influence of the sun for many years. And they have found that, while the sun certainly is not irrelevant, the case for steadily rising carbon dioxide as the principal factor driving the current warming trend just makes a lot more sense. Willie Soon and some other climate change doubters would surely argue back against this finding — but it’s a strong consensus finding, as shown above. The weight of expert opinion isn’t with these doubters — but the burden of proof most definitely is. Hier liegt die Washington Post einmal richtig: Es gab in der Tat ein Vielzahl von Studien zum Thema Sonne-Klima. Allerdings fanden sie etwas ganz anderes, nämlich eine starke klimatische Beeinflussung. Der IPCC hat diesen wichtigen empirischen Befund in seinen Formeln einfach ignoriert und lässt mit einem verschwindend geringen „Strahlungsantrieb“ von solaren Schwankungen rechnen, also einer minimalen Klimawirksamkeit der Sonne. Der Hinweis der Washington Post auf die IPCC-Ergebnisse ist daher eher kontraproduktiv, da die IPCC-Sichtweise die realen Daten nicht erklären kann. Klimawandel: Doch kein Einfluss der Sonnenaktivität? Vermeintlicher Anstieg entpuppt sich als Methodikfehler bei der Sonnenfleckenzählung. Die Sonnenaktivität hat weniger Einfluss auf die aktuelle Klimaerwärmung als angenommen. Denn ausgerechnet die Zeitreihe der Sonnenaktivität, die für einen Anstieg sprach, enthielt offenbar methodische Fehler, wie die Internationale Astronomische Union (IAU) berichtet. Nach einer Neukalibrierung der Methode geben nun historische Sonnenflecken-Beobachtungen keinerlei Hinweis mehr auf einen signifikanten Anstieg der solaren Aktivität seit Beginn der Industrialisierung. Außer beim recht unauffälligen SC10 [Solar Cycle 10] und dem SC22 ergeben sich keine nennenswerten Abweichungen, wir müssen hier also nicht die Geschichte der Solaren Zyklen neu schreiben. Internationales Forscherteam rekonstruiert historischen Verlauf der Sonnenaktivität und prognostiziert deren Rückgang in wenigen Jahrzehnten. Die Aktivität der Sonne im Verlauf der letzten 11.400 Jahre, also zurück bis zum Ende der letzten Eiszeit, hat jetzt erstmals eine internationale Forschergruppe um Sami K. Solanki vom Max-Planck-Institut für Sonnensystemforschung durch Isotopenanalyse von Jahrtausende alten Bäumen und Polareis rekonstruiert. Wie die Wissenschaftler aus Deutschland, Finnland und der Schweiz in der neuen Ausgabe der Zeitschrift “Nature” berichten, muss man über 8.000 Jahre in der Erdgeschichte zurückgehen, bis man einen Zeitraum findet, in dem die Sonne im Mittel ebenso aktiv war wie in den vergangenen 60 Jahren (nature, 28. Oktober 2004). Aus dem Studium früherer Perioden mit hoher Sonnenaktivität sagen die Forscher voraus, dass die gegenwärtig hohe Aktivität der Sonne wahrscheinlich nur noch wenige Jahrzehnte andauern wird. Weiterlesen auf der Webseite der Max-Planck-Gesellschaft. Hier muss man sich nicht mehr mit Sonnenflecken herumschlagen. Die Isotopen sprechen eine klare Sprache: Die zweite Hälfte des 20. Jahrhunderts war solar ungewöhnlich stark aktiv – und genau in diese Phase fällt ein großer Teil der vieldiskutierten Klimaerwärmung. Wirklich alles nur purer Zufall? First, what’s the story? A group led by Frédéric Clette had a presentation at the IAU assembly in Hawaii. In it, they argued that the sunspot number suffers from various systematic errors as it is a subjective measurement. Because those systematic errors vary with time (with the different observers and observational methods), the SN reconstruction can exhibit a fictitious long term trend. They also attempted to calibrate the data, and obtain a more homogeneous dataset. This is described at length in their arXiv preprint. The most interesting aspect about their new sunspot reconstruction is that there is significantly less variation in the sunspot number between the different solar maxima since the Maunder minimum. This implies, according to them, that there wasn’t a significant increase in solar activity over the 20th century (no “20th century Grand Maximum”), and therefore the sun should not have contributed anything towards increased temperatures. This point was of course captured by the media (e.g., here). Figure: The old (red) and new (blue) sunspot number reconstructions of Clette et al. So, what do I think about it? First, I have no idea whether the calibration is correct. They do make a good argument that the SN reconstruction is problematic. Namely, some corrections are probably necessary and there is no reason a priori to think that what they did is invalid. However, their claim about solar activity in general not varying much since the sun came out from the Mounder minimum is wrong. There are other more objective ways to reconstruct solar activity than subjective sunspot counting, and they do show us that solar activity increased over the 20th century. So at most, one can claim that solar activity has various facets, and that the maximum sunspot number is not a good indicator of all of them. This is not unreasonable since the number of sunspots would more directly reflect the amount of closed magnetic field lines, but not the open ones blowing in the solar wind. The two important objective proxies for solar activity are cosmogenic isotopes (14C and 10Be), and the geomagnetic AA index. The AA index (measured since the middle of the 19th century) clearly shows that the latter part of the 20th century was more active than the latter half of the 19th century. The longer 10Be data set reveals that the latter half of the 20th century was more active than any preceding time since the Maunder minimum. (The 14C is a bit problematic because human nuclear bombs from the 1940′s onwards generated a lot of atmospheric 14C so it cannot be used to reconstruct solar activity in the latter part of the 20th century). Figure 2: The AA geomagnetic index showing a clear increase in solar activity over the 20th century (From here). Figure 3: The 10Be production showing again, that the sun was particularly active in the latter half of the 20th century. The sunspot number is the “old” reconstructions without Clette’s et al. corrections. What does it tell us? Given that long term variations in Earth’s climate do correlate with long term solar activity (e.g., see the first part of this) and given that some solar activity indicators (presumably?) 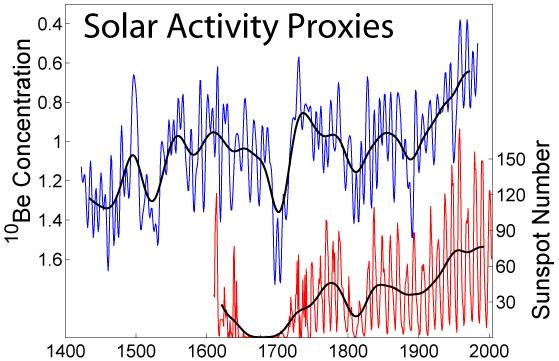 don’t show an increase from the Maunder minimum, but some do, it means that climate is sensitivite to those aspects of the solar activity that increased (e.g., solar wind), but not those more directly associated with the number of sunspots (e.g., UV or total solar irradiance). Thus, this result on the sunspots maxima (again, if true), only strengthens the idea that the solar climate link is through something related to the open magnetic field lines, such as the strength of the solar wind or the cosmic ray flux which it modulates. Weiterlesen in Nir Shaviv’s Blog.